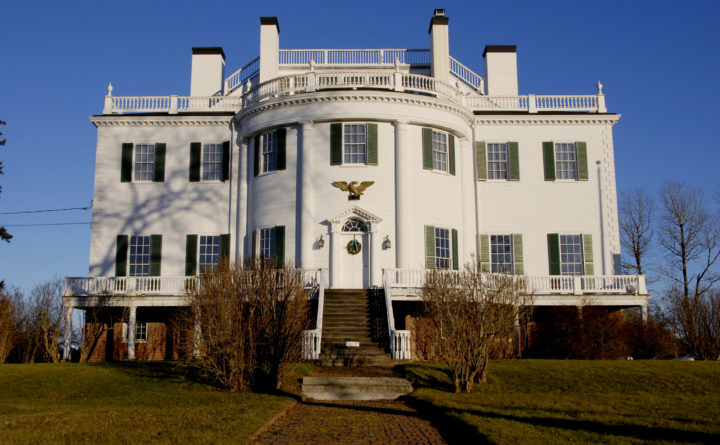 Located on Route 131 in Thomaston, Montpelier is the site of the General Henry Knox Museum. At the end of last year, it wasn’t certain that the General Henry Knox Museum would open for the 2018 summer season. But after a slew of donations and with lower staffing costs, the Thomaston-based museum is ready to hold its first big event of the season at the end of next month. “We’re really looking forward to it. It’s been an eye-opener for us, for the executive committee … to understand the museum operations and what is going on,” Peter Ogden, chairman of the Knox Museum’s board of directors, said. The museum is in the midst of a capital campaign launched last fall, with about two-thirds of their $150,000 goal raised, according to Ogden. In January, the museum’s board its fundraising was enough to keep the doors open for the 2018 season. The Knox Museum honors Revolutionary War General Henry Knox, who later served as President George Washington’s secretary of war, before retiring to Thomaston where he built his estate, Montpelier. The Knox Museum is housed in a mansion that is a replica of the original Montpelier estate. The Knox Museum’s financial crisis stemmed largely from the fact that the museum has never been financially viable on its own and has operated for years at a deficit. Money from financial gifts have allowed the museum to get by, but that money has slowly been running out. Since the beginning of 2018, the board’s seven-person executive committee has been looking at ways to trim the annual budget, Ogden said. In February, the museum’s executive director position was eliminated, a move that will save about $50,000 annually, Ogden said. The elimination of the executive director leaves one full-time and one part-time paid employee. The executive committee will assume the majority of the duties that the executive director handled, Ogden said. Ogden said the executive committee is also looking at where it can cut monthly utility expenses, such as phone service. Hours and ticket prices will not change, which is designed to maximize revenue from admissions, Ogden said. The museum will hold its annual Boots on the Ground event May 26, which pays tribute to veterans on Memorial Day weekend. On June 8, the museum will hold its season kickoff event and open for normal visiting hours. As part of the effort to streamline the museum budget, Ogden said the number of events the museum hosts will be scaled back, focusing on the signature events that are related to Henry Knox. The board is looking at a few other ways to make the Knox Museum financially viable for the long term, Ogden said, including setting up a program for planned giving, which would allow for the museum to receive financial gifts if an individual puts the donation as a term in their will. Ultimately, the Knox Museum’s overseers hope to establish an endowment.